This truly game-changing device opens up countless possibilities for ‘embedded intelligence’ as required by the new national curriculum. What makes it unique is the much lower cost than any comparable device (about the same as our IQ4 controller) and the ease of use. 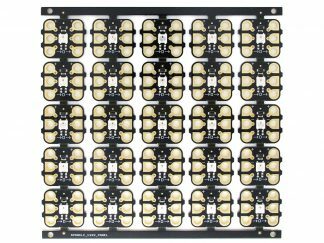 Non-electronics specialists can use it right away BUT, at the same time, it offers unlimited potential for advanced users – including electronics professionals. You simply create a programme on a computer screen by moving icons into the right position – e.g., to turn things on and off – and then plug in the Crumble. The programme is immediately transferred and turns Crumble into whatever you tell it to do. 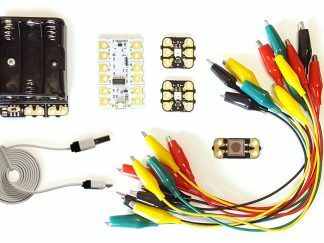 Drawing power from a very small battery, it might be applied to anything from turning LEDs on and off in smart clothing to driving and steering a robot. Starter Pack also available. Please see HERE. Download the FREE Software from Redfern Electronics . (External Link). NOTE: This device is designed and supplied to assist teachers deliver the national curriculum at a time of severe cost constraint. There are no hidden charges for software etc. That is all free. The Crumble embedded controller is programmed using a PC/Mac/Linux application based on MIT Scratch. 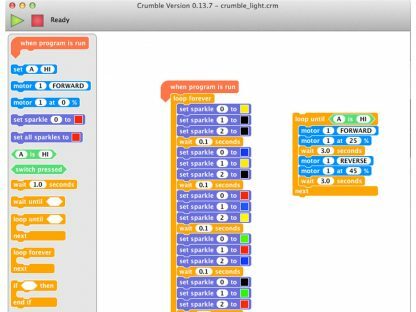 Compatibility with the Raspberry Pi is planned. 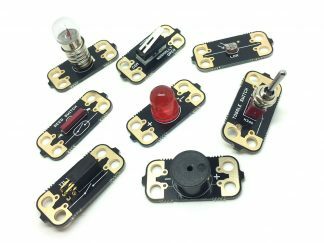 Input and output devices can be connected using croc-clip test leads to encourage experimentation. 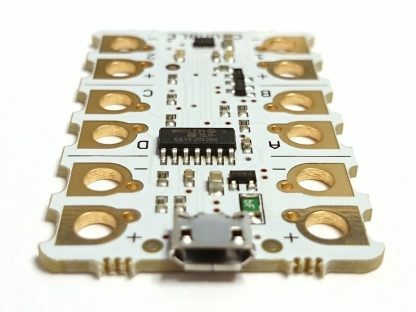 Solder pads with 1mm holes are also provided (at terminal block spacing). It should also be possible to use conductive thread to connect directly. 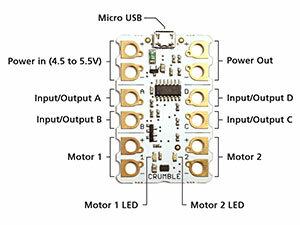 Four input/output connections allow simple sensors, switches and LEDs to be connected directly to the Crumble. 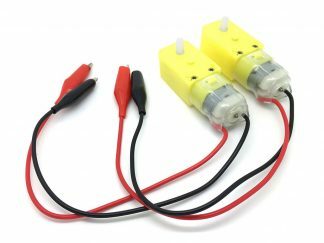 Two high power outputs can be control motors and similar devices. 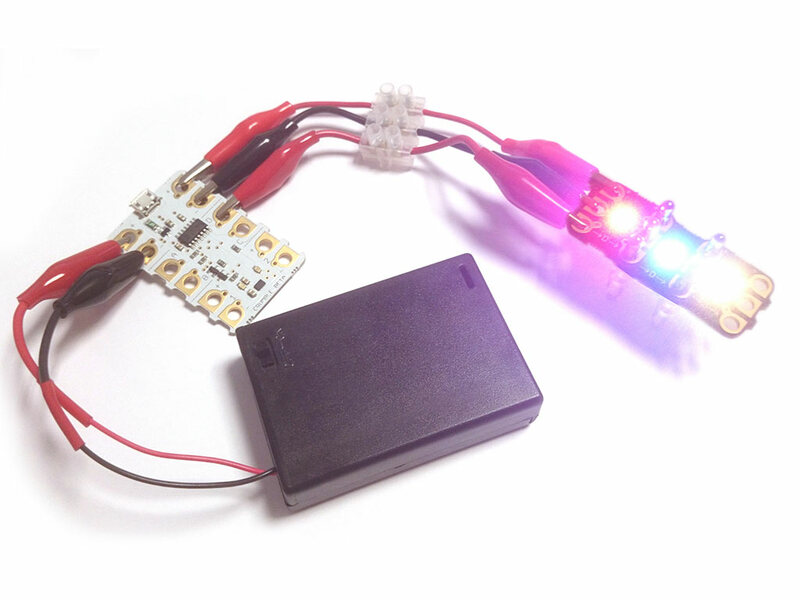 The on-board micro USB socket allows the Crumble to be programmed via a standard USB cable. The Crumble can be powered directly from USB, however, the motor driver and any external boards require an external power source of 4.5V to 5.5V (for example 3xAA batteries). 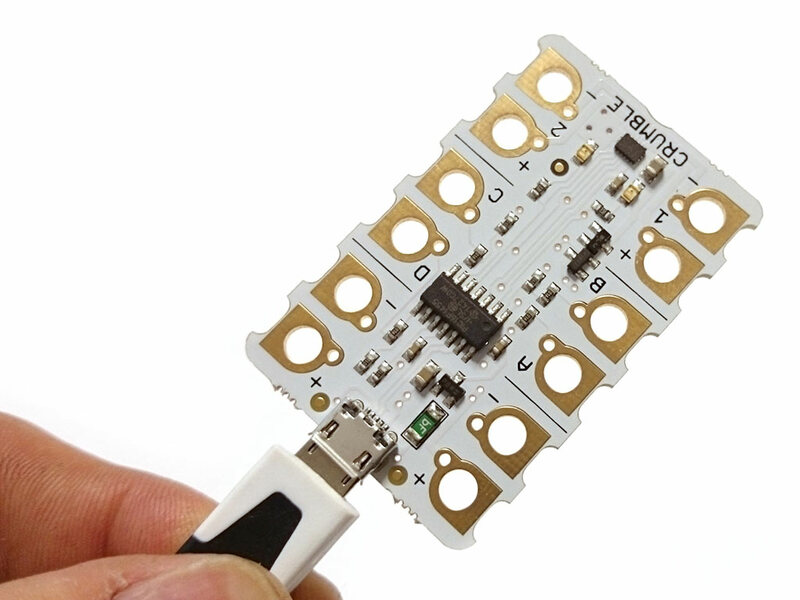 The external power source will also power the Crumble when not connected to USB. There are two pairs of power pads to allow pass-through to expansion boards, or ‘Crumbs’. 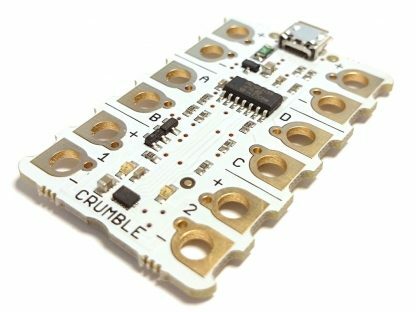 Daisy-chain-able expansion boards called ‘Crumbs’ will add extra functions to the crumble. 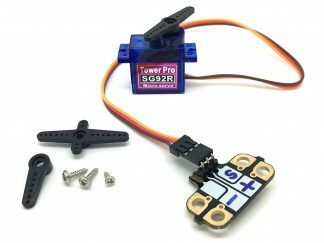 Crumbs to include: Servo controller; motor controller; colour sensor; digital temperature sensor and so on. 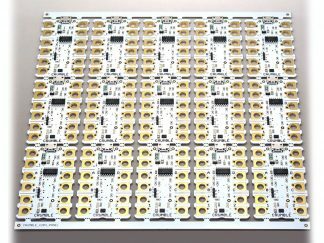 Individually controllable RGB LEDs called ‘Sparkles’ will work in a similar way.